Did you know Houses built before 1970 typically installed septic tanks constructed of manmade cinder block..
Septic Tank Risers and Lids or Covers are designed to replace existing concrete, fiberglass, or metal septic tank covers. Drain fields and drain lines area also referred to as leach fields / leach lines and soil absorption fields. Drain fields are also known as leach fields or soil absorption field. Drain lines are also referred to as Leach lines. Do you have a saturated drain field? Terralift could be the solution for you. Do you have smelly, slimy puddle around your septic tank? You may have been told that you need septic drain field repair, new septic drain lines or that a TerraLift operation is an alternative to a complete septic drain field replacement. You may have found out that you do not qualify (for a number of reasons) for adding new drain lines or replacing existing lines. Or, you may realize something is wrong with your septic system, but don’t know where to begin. The solution could be as simple as having your septic tank pumped, among other possibilities, it could also be compaction around your drain lines. In 1996, a technological breakthrough in septic drain field repair, called Terralift, was introduced to reduce compaction around septic drain fields without damaging your yard. The process worked so well that now 20 years later Jarrid Lentz, the owner of Lentz Wastewater Management, still utilizes that same technology. The results are instant, the effects are long-lasting and the cost is significantly lower than replacing septic drain lines. A long, narrow probe is used to penetrate deep into the ground from depths of six (6) to sixty (60) inches. At 300 psi, controlled air is forced into the deep soil. Increasing and decreasing air pressure allows for varying degrees to the width of the service area. First, Lentz Wastewawater marks each specific spot to be probed six to eight feet apart on both sides of the septic drain line for maximum efficiency. Next, the technician then places the Tera lift machine over each mark where a six-foot-long probe enters the soil. Once the probe reaches the proper depth, a blast of compressed air is released. Cracks and fissures are created, deep into the soil by the blast of air. These cracks and fissures allow liquids to pass through. Finally, the probe shoots tiny polystyrene beads, under pressure, into the new fractures. This allows the new fissures to remain permanently open after the ground settles. The tiny polystyrene beads are a key component to the longevity of the Terra Lift. The beads and the air will move horizontally and vertically throughout the soil. Our technicians use the maximum amount of beads recommended by terralift international to ensure that the passageways remain open as long as possible. The terra lift process is quick and will revitalize your septic system absorption field. At a fraction of the cost of replacing your septic drain lines, Terra Lift (or Terra-Lift) is an effective alternative to instantly improve the drainage on and around your septic drain lines. 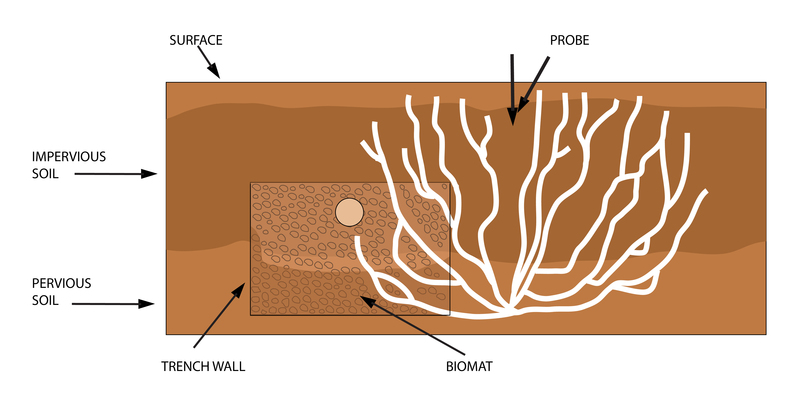 The Terralift is used to penetrate the soil all around the leach field’s perimeter (see diagram below) and inject air and polystyrene beads to maintain passages for the exchange of liquids and gasses, or other natural agents to accelerate the decomposition of organic matter. 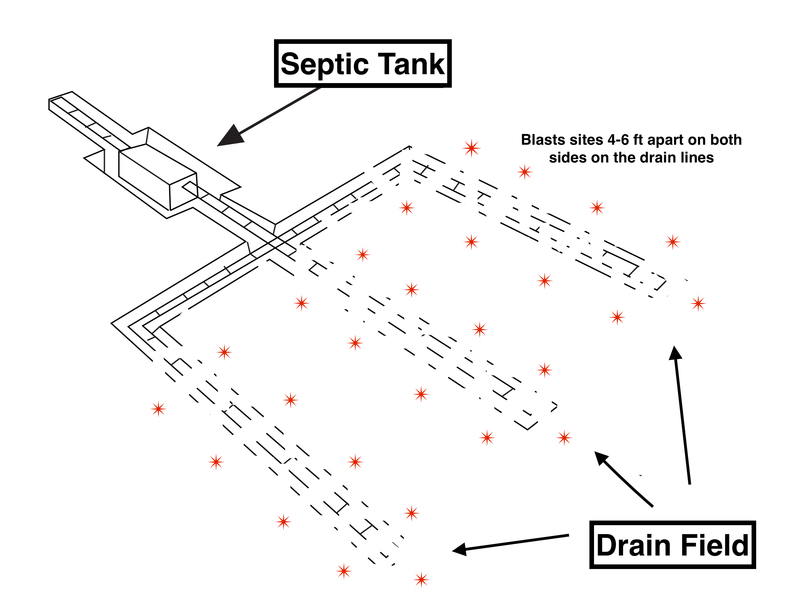 Septic tank level consistently high and water comes back from the drain field even after it has been pumped down. You cannot do laundry at home anymore because the system cannot handle the water output. How much it costs to have your septic drain field or individual drain lines replaced? ~ vs. ~ How much it costs to have your drain field repaired by a TerraLift operation? How does a Terra Lift work? Is there a difference in quality or effectiveness between the TerraLift operation one company provides vs. their competitors? What kind of results should I expect if I do choose TerraLift instead of drain field replacement? How Much Does it Cost for Septic Drain field Repair or Replacement vs. TerraLift operation? In the Piedmont area of North Carolina, around Lake Norman, Charlotte and Statesville, NC, replacing septic drainlines depends on many factors. First, you must obtain a permit from the Health Department in your city or county, which you may not be able to do, as many locations will require you to tap into the city or county sewer instead of replacing septic drain lines. Second, once you have your permit, which could cost hundreds of dollars, you must install the new lines in the location as specified by the Health Department, and connect them correctly from the existing system. This process is expensive. Not only does it cost to have the septic drain field or drain lines replaced, but your yard will be damaged significantly by the machines that are necessary to dig the new septic drain lines. Typically, Terralift is a fraction of the price to replace a drain field. How Does a TerraLift machine Work? TerraLift was designed to pump air fissures or open veins of air into the soil so that the wastewater from the septic drain lines has a place to go. Iredell County and surrounding areas have heavy, compacted, clay. This type of soil makes water retention a huge problem for septic systems. 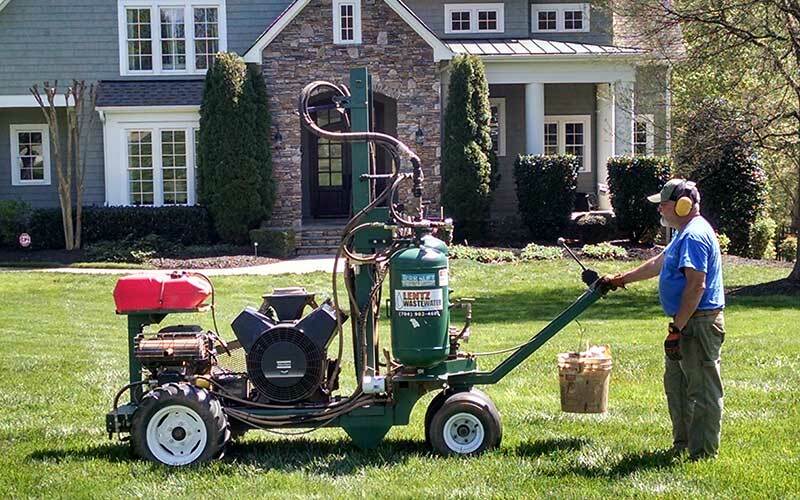 Much in the way that aerating (or core plugging) is important for your lawn, the TerraLift machine pumps air pockets deep into the compacted clay soil, allowing the wastewater a much larger area to dissipate. Immediately after the fissures are “blown” into the soil, a blast of tiny, polystyrene beads fills up the fissures, creating a permanent pocket of veins in which wastewater may travel. This action provides a lasting solution to the compacted, saturated septic drain field area. Because the operation is performed so deep in the soil, the opportunity for additional compaction is not likely. Is there a difference in effectiveness between the TerraLift operation one company provides vs. their competitors? As with any business, price is going to be somewhat different from one company to another. Why would you choose Lentz Wastewater over another septic service contractor? Lentz Wastewater Management operates on the foundation of “Do it Right the First Time” so that you don’t have to go back later to fix it. 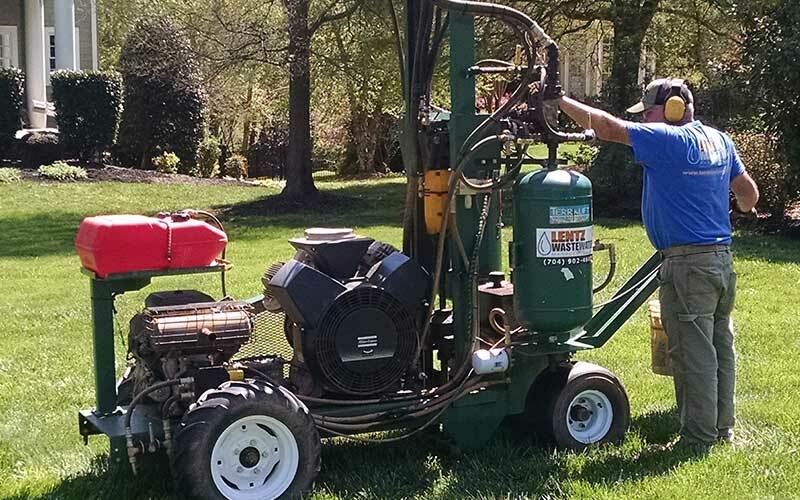 Jarrid is always going to go above and beyond to ensure your septic service is successful. Jarrid’s experience has shown him that the more cracks and crevices that are forced into the soil, the more effective the Terralift results will be. The same is true with the amount of polystyrene beads. Lentz uses the max amount of polystyrene beads on each Terralift operation.. 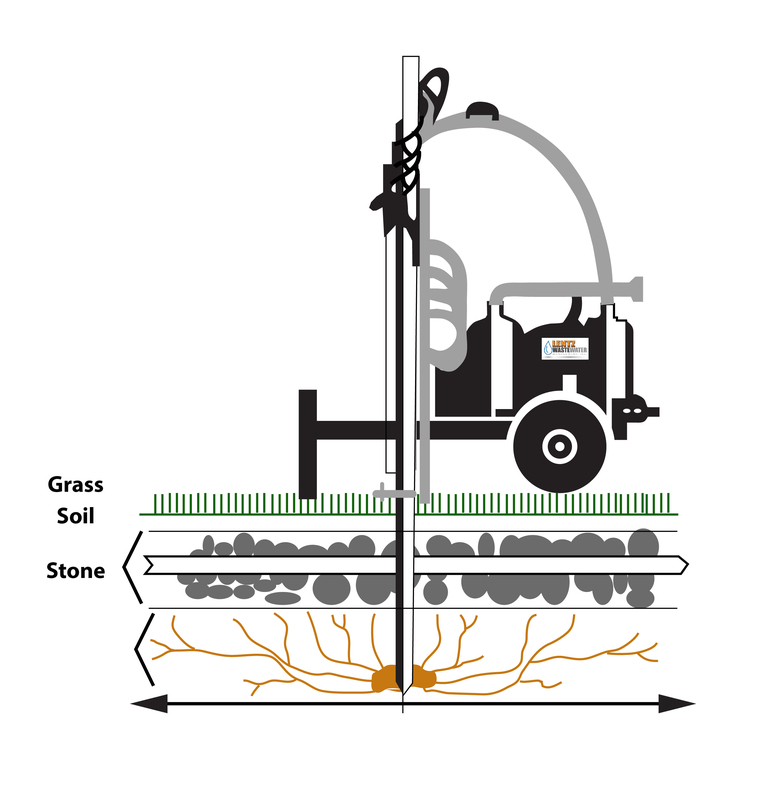 The TerraLift machine blows fissures more than 8′ away from the initial blast, and in order to get the most efficient coverage, Jarrid marks the location for each blast at 6-8′ apart, and on BOTH sides of each septic drain line. What kind of results should I expect if I do choose TerraLift instead of septic drain field replacement (or tapping into city or county sewer)? The first thing that should happen if the TerraLift is the solution, is the water in your septic tank will go down. Second, the septic drain field will start to dry out. 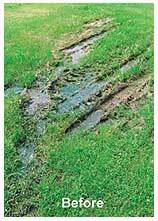 The mushy, soft soil may remain for a few days, depending upon how long it had stayed wet. But, eventually, it will get back to normal, stop smelling, and become much more “user-friendly” so that your family can enjoy the back yard again. The results are typically immediate, and the repair technicians will often know before putting the lid back on the tank if the operation worked or not. If the water does not go down, there is quite likely another problem, and it can be assessed at the time that our professional team is on site. In most, if not all, situations where the TerraLift was not any part of the solution, Jarrid Lentz will not charge for that service, and will re-evaluate the situation to provide a solution that will work. If the TerraLift operation was the solution to the saturated drain field problem, the results should last several years. Some people have had another TerraLift service after 6-8 years, others have had it done once and even after more than 15 years still have not had additional problems. Contact Lentz Wastewater Management. We will provide a comprehensive evaluation of the most cost-effective solution to your problem. Lentz wastewater management is an accredited business with the Better Business Bureau and Terralift comes with a warranty.